This procedure covers one commonly used method for removing surface mount J lead components. Conduction tip shown with solder added to enhance removal operation. 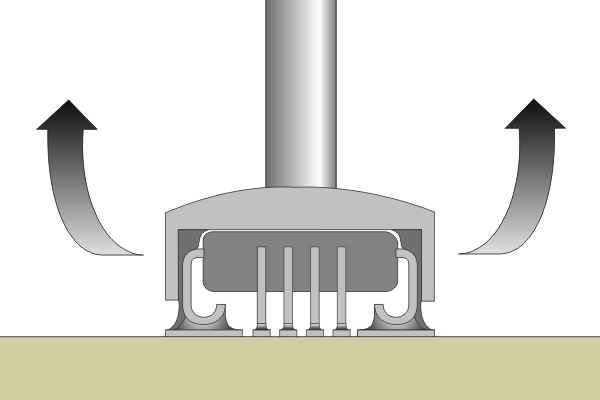 Figure 1: Conduction tip shown with solder added to enhance removal operation. Figure:3;A - Dot indicates pin 1;B - Indicates pin 5;C - Indicates direction of pin count. This method uses tips that are designed to fit over the top of surface mount components, and to reflow all the solder joints at once. The tip fits over the component with just a slight amount of extra space for solder. Measure the overall length and width of the component with a caliper to select the proper size tip. Check the tip for proper fit prior to processing the part. 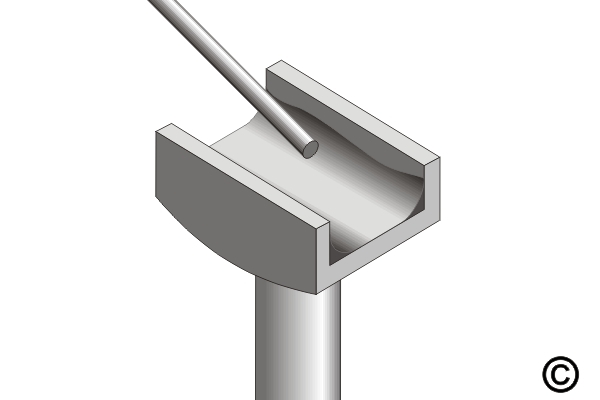 The tip should not fit the component so tightly that it will get lodged in the tip, but the tip should not be so loose that it will not conduct heat to all the leads simultaneously. Conduction tips come in several sizes to accommodate many of the different styles and sizes of components, but the component must fit properly in the tool cavity. Since these tips have a cavity, they require special cleaning and tinning procedures. Carefully inspect the tip to ensure that all surfaces will properly contact the component leads. Remove any solder from inside the tip cavity with a fiber tool. Do not use a wire brush for any tip cleaning procedure. A wire brush can severely scratch a metal tip. Scratches allow oxidation to form on the base metal of the tip and this will severely decrease the useful life. Remove any oxidized solder by shocking the tip on a wet sponge. Remove stubborn charred residue using an orange stick or polishing bar. Add solder to the properly prepared tip. Fill the cavity until there is a fillet on the entire length of each side of the tip. (See Figure 1) Add enough solder to help transfer the heat quickly but not so much that it will fall out when the tip is turned upside down. The entire conducting surface of the tip should be tinned with solder to promote proper heat transfer to the leads of the component to be removed. The solder provides surface tension to lift the component off the pads after reflow. 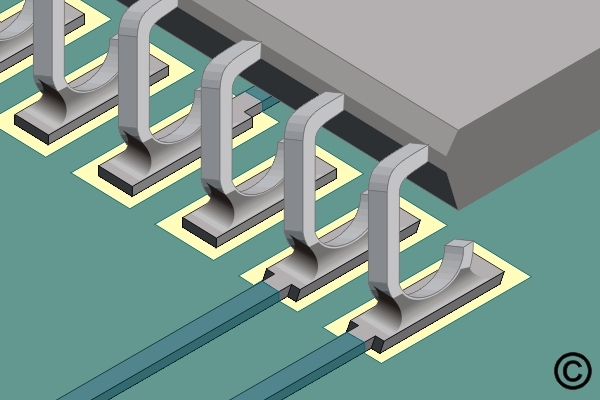 Since the tip has more metal surface area than the pads on the circuit board, the solder will be drawn toward the metal tip and so will the component. Determine the direction the part is to be swept off the circuit board surface. Densely packed circuit board assemblies often leave only one direction for the rework tool to follow when sweeping the part off the surface. Apply a small amount of liquid flux to all leads of the component. It's difficult to know precisely how long to dwell prior to safely removing the part. This is complicated by the fact that when removing a bank of components, parts subsequent to the first come off much faster. Obviously, the smaller the part the quicker it reflows. Small SMT components may reflow in a few seconds and large SMT components may take more than a minute. On the smaller components you can usually see solder reflow and can then sweep the component off and up. On larger components it is wise to attempt to view reflow but often this is not possible. If you cannot clearly see reflow very lightly rock the component to test for movement. If the component moves freely then it is ready to be swept off the pads and lifted up. Once the component is removed from the circuit board it can be removed from the tip by the shocking sponge or with a dull blunt instrument applying downward pressure on the component.